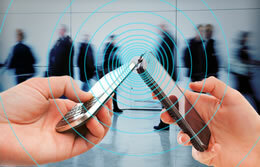 A report by ABI Research shows that the number of NFC-enabled devices hitting the market will greatly increase by 2014. In “NFC Devices, Strategies, and Form Factors,” the firm has analyzed the market to find that at least 285 million NFC-enabled mobile and consumer electronics devices will ship in 2013, and that number will increase to over 500 million in 2014. Mobile manufacturers are driving the push for NFC, as mobile network operators are downscaling, revising or reconsidering their positions, says John Devlin, practice director. Google Wallet turned out to be a factor in mobile network operator strategies because it introduced a new business model for payments. Now companies are looking for additional streams of revenue to pay for their investment. “They’re looking at where they can provide value, which can be a drawn-out process,” says Devlin. ABI says that many manufacturers have created and implemented NFC strategies that could help generate new service-based revenue streams, as Blackberry and Samsung are doing, or they could horizontally integrate NFC across a broader portfolio, an approach that LG and Sony have taken. “Yes, there’s a lot of payments, but there’s a lot of other stuff too,” says Devlin.